These fine mesh grids are carefully checked. They are suitable for the low magnification range of a TEM. Available as a sandwich in a folding 3.05mm mesh grid, or in a square mesh 25mm. Parallel: Shadowcast carbon replicas of diffraction parallel line gratings with spacing of 462.9nm, 2160 lines per millimeter onto 3.05mm grid. Crossed: Cross line pitch spacing of 463nm with 2160 lines/mm in both directions, cross at 90° to one another give additional accuracy to magnification checks and aid in checking distortion. Trench-type groove makes it easy to measure pitch. Ideal for calibration electron-optical magnification up to the x80000/100000 range. The latex sphere is 0.261 microns and the grating replica is 2160 lines/mm. This calibration id allows you to double check the accuracy of magnification calibration. Measuring and correcting astigmatism and for evaluating the resolution of the transmission electron microscope. A thin film of carbon has been treated to obtain numerous round holes of various sizes. On a 3.05mm copper grid. Evaporated Pt/Ir on Holey carbon film. Holey carbon film support provides holes for ease of focus and astigmatism correction. The dots of evaporated Pt/Ir provide dense particles for resolution checks through the particle seperation test. Uniform polystyrene latex (size 0.204 microns) is suspended on a Formvar/Carbon grid and is usefule for checking magnification and calibration. These latex particles have a diameter of 0.204µm and are shadowed with a coating of gold. Measure the finest migrated gold particles in the shadow to determine the resolution of the STEM. Gold shadowed latex on formvar/carbon film, mounted on a copper grid, 3.05mm diameter. Catalase crystals are mounted on a grid (3.05mm) and negatively stained. They display very clear lattice plane spacings of approx. 8.75nm and 6.85nm. Ideal for high magnification calibration. Resolution of the quad structure of this molecule indicates an instrument resolution better than 1.25nm with a photomicrograph negative magnification of at least 100,000x. A holey carbon film is shadowed with gold and graphitized carbon particles are deposited on a 3.05mm grid. These particles viewed over the holes may be used for assessment of factors limiting the microscope performance. The evaporated gold forms small polycrystalline islands and within these islands lattice fringes can be resolved. Also use this specimen for the measurement of contamination rates in the EM by noting the deposition rate of carbon within the holes found in the gold film. Particle-size standards are certified for mean diameter and are traceable to the National Bureau of Standards (NBS). Duke Scientific's new line of standards in the submicrometer size range is called Nanosphere Size Standards™, and Monosized Polymer Microspheres. Nanosphere Size Standards are highly uniform polystyrene spheres calibrated in billionths of a meter (nanometer) with NBS traceable methodology. Nanosphere Size Standards are used in the calibration of electron microscopes, aerosol and liquid particle studies, chromatography columns, and laser light scattering studies. The 20 to 1000 nm range is suitable for checking the size of bacteria, viruses, ribosomes and sub-cellular components. 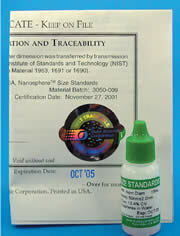 Nanosphere Size Standards are packaged as aqueous suspensions in dropper-tipped bottles. Refractive index of 1.58 @ 589nm (25°C). TM Trademark of Duke Scientific Corp.
* Monosized Polymer Microspheres are the most uniform spheres available. For the highest level of measurement accuracy in the 1 to 40 micron size, this series of size standards is recommended. Since crystal lattice plane spacings are accurately known from x-ray measurements, they provide a good test of microscope stability and a calibration of magnification in the upper range of magnification of the instrument. 1) Plane Spacing 0.9nm and 0.45nm – Asbestos Crocidolite. The 0.9nm spacing (020) will be found along the axis of the crocidolite fibers. The 0.45nm spacing appears at an angle of about 60° in suitable crystal orientations. Because of the hazards of asbestos, this sample is sandwiched between carbon and formvar films, than mounted onto a 3.05mm grid. These gold foils are mounted on gold grids, a valuable tool to check resolution, image quality, magnification and instrument stability. This high resolution TEM test specimen is an arrangement of finely-dispersed thin gold particles on carbon film. As with gold foil, image quality, magnification, and instrument stability are readily assessed; however, for the determination of resolution capabilities this gold particle specimen is superior since it offers a choice of crystalline orientation on static or low tilt stages. In addition, the thickness of the crystalline material is easily calculated from the projected shape of the gold crystal. The background noise arising from structure in the support film helps with determinations of the operating transfer function. TEM analysts also need to monitor the performance of their x-ray detectors. The TEM Checker contains 5 manganese disks in a standard grid storage box. Each disk is 3 mm in diameter and fits into the sample holder. The discs are not transparent to the beam but will give you a strong manganese peak to check the resolution of your EDS detector.